Around the very good 14-inch display can be found a variety of ports, including a pair of high-speed Thunderbolt connectors ideal for driving external displays. Battery life is also very good, though that’s assisted by the somewhat basic 1080p display that accompanied our review unit. Under the hood, there’s an 8th-gen Intel Kaby Lake-R processor that accomplishes quite enough for most business tasks. It may be be a few hundred dollars more than the competition, but that hasn’t prevented it from earning our Editors’ Choice award. Read on for why. The carbon construction also pays dividends in terms of weight. One of the theoretical advantages of a Windows tablet like the sturdy 2017 HP Spectre x2 is its mobility, at 2.48 pounds on our scale. 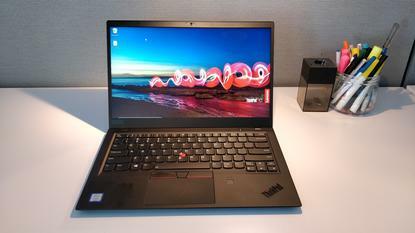 But the Lenovo X1 Carbon 6th gen weighs even less: 2.46 pounds, and it’s far sturdier on the lap. All told, you’ll almost certainly be surprised with how thin and light it feels in the hand. 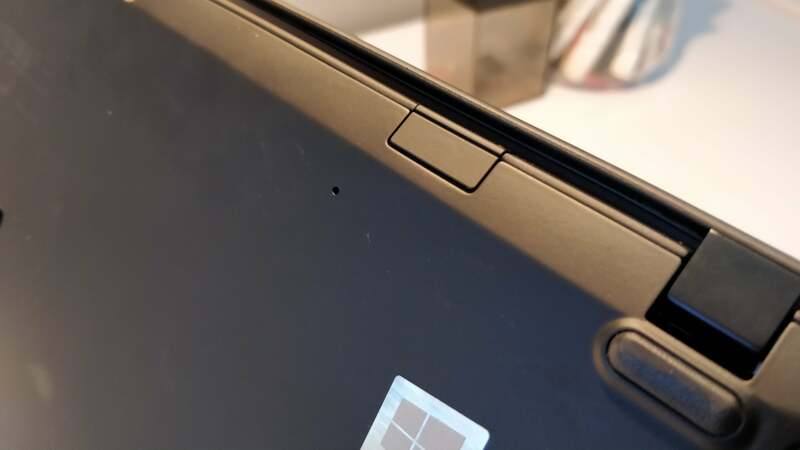 Open the Carbon’s cover, and you’re met with the X1 Carbon’s display, not typically one of Lenovo’s traditional strengths. Four options are available, all 14-inch panels: The 1920x1080 display generated 309 nits using our tests. We generally test with a brightness between 250 and 260 nits as a comfortable level for daily work, and measure battery life accordingly. Hitting that target was a smart decision on Lenovo’s part, as it maximizes battery life without sacrificing additional brightness. Maybe I’m just used to higher-res panels, but the 1080p 14-inch panel looked a little too squished for an everyday, business notebook. 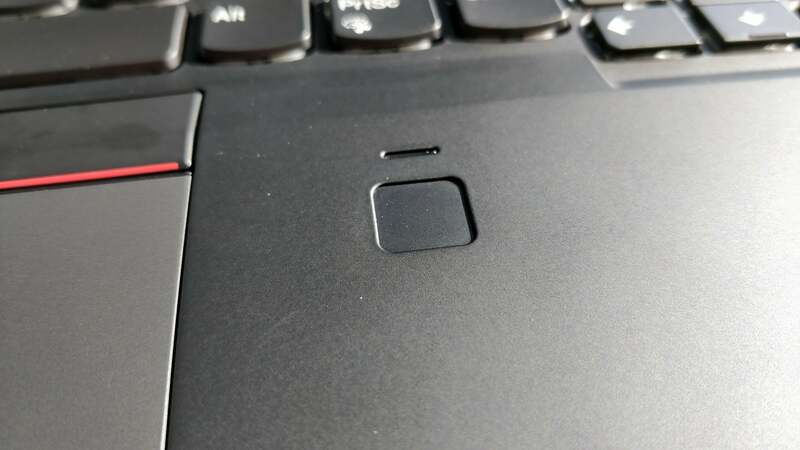 And to my eye, the ThinkPad X1 Carbon’s image quality looked a bit too yellowish, even when Lenovo’s software reported a maximum color temperature of 6500K. Turning on Eye Care mode (the equivalent of Windows’ “night light” settings) within the Lenovo Vantage utility software really dialed down the blue light (4500K). But, like Windows, you do have the ability to make adjustments via a slider bar. 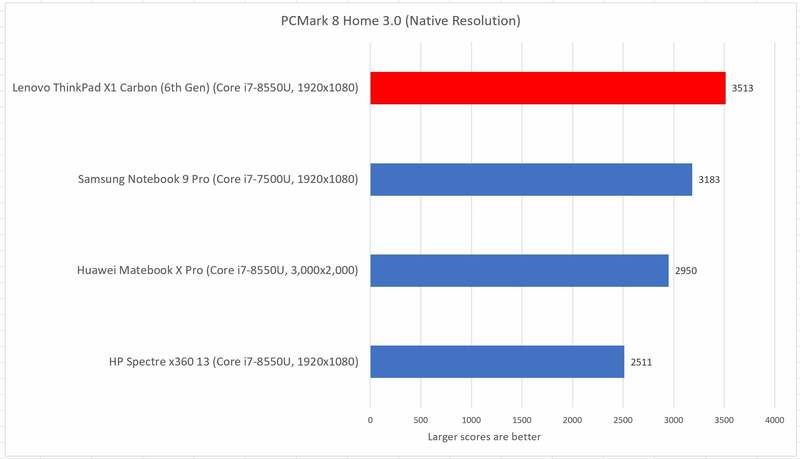 As we normally do, we measured the X1 Carbon 6th Gen’s performance using our trio of PCMark’s benchmarks: Work, Home, and Creative. 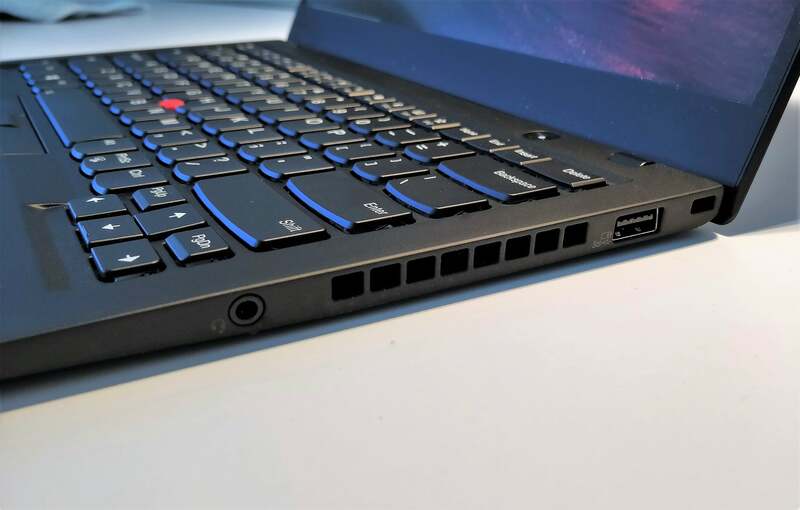 Remember, with a 1.8GHz Core i7-8550U (Kaby Lake-R) chip inside it, the X1 Carbon should plow through general office tasks handily, and in our experience, it did so. The Work test measures Web browsing, working with Excel spreadsheets, and more. 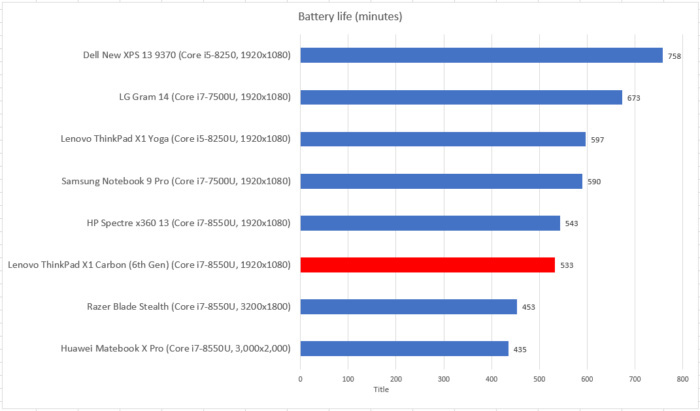 Clearly, its 8th-gen Core chip elevates it to the top of the heap. The Home test emphasizes light gaming and photo manipulation. We normally test consumer products using the Creative test as well, though some of our business-class products drop this test. 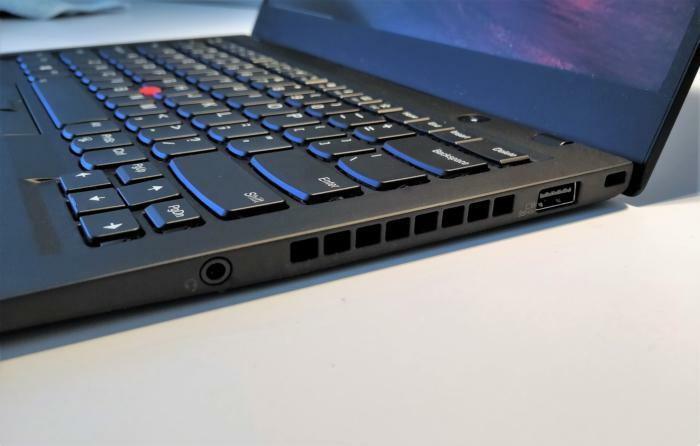 (Though we don’t show it here, the X1 Carbon 6th Gen finished at the top of the small number of thin-and-lights we tested using the Creative test.) 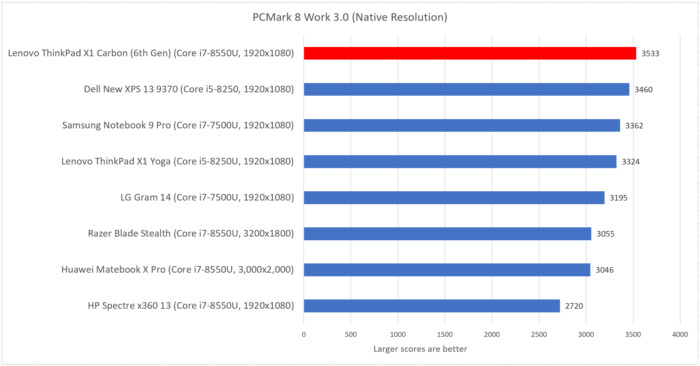 In all of these, the X1 Carbon 6th Gen performed admirably. 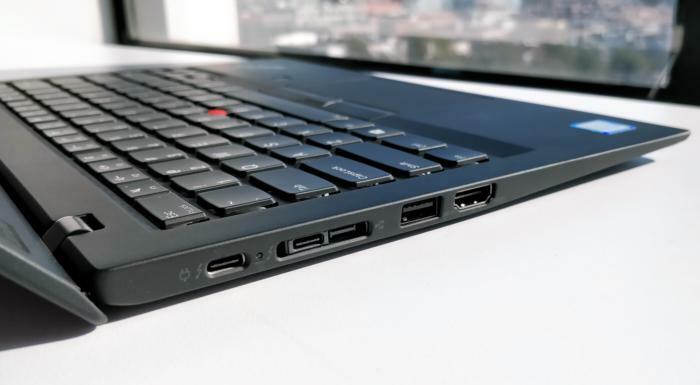 Again, the ThinkPad X1 Carbon tops the others. The Lenovo ThinkPad X1 Carbon 6th Gen tops the heap in our Home test, which we don’t always apply to business-focused PCs. 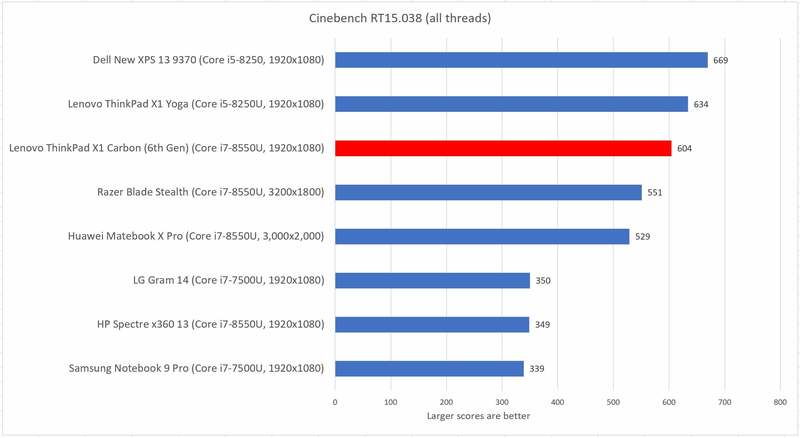 Maxon’s Cinebench benchmark, which asks the system to render a 2D scene, is the closest to a universal benchmark that we use, stressing the four-core, eight-thread Core i7 8550U to its utmost. We stress-test using all of the cores enabled. Again, this was a test that we found was susceptible to ambient heat, which may have reduced the X1 Carbon’s performance slightly. Still, it’s in the top tier. Under the Cinebench rendering test, the Lenovo ThinkPad X1 Carbon 6th Gen can be found near the top of the heap. The HandBrake open-source tool pushes all four cores, converting a top-tier Hollywood movie into a resolution that can be used on an Android tablet. It’s a good, prolonged stress test for how the laptop will hold up over prolonged exertion, and the X1 Carbon is almost at the top. 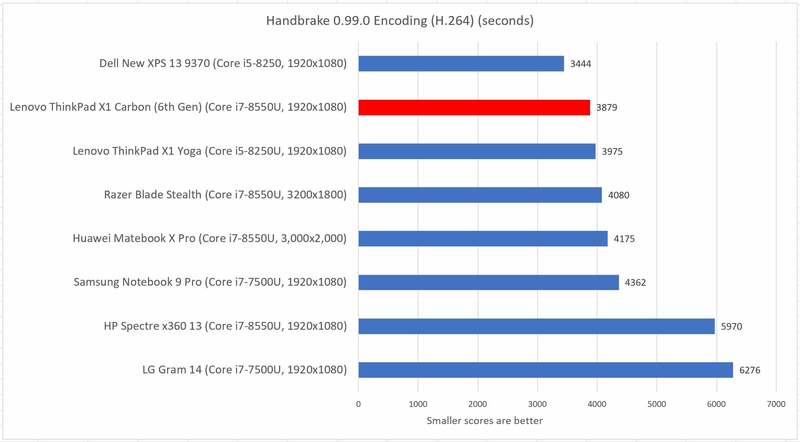 Our prolonged Handbrake test shows off the power of the Lenovo ThinkPad X1 Carbon (6th Gen) and its 8th-gen Core chip. Finally, we look at 3D performance using the integrated HD 620 GPU. We don’t expect much here out of a business laptop, and its performance near the bottom reflects that. 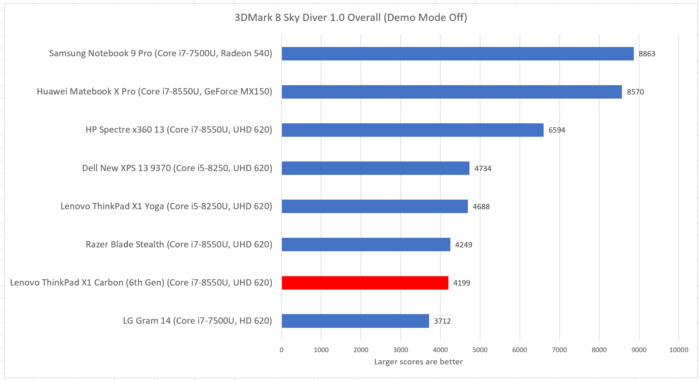 3D performance is one of the few weak spots for the Lenovo X1 Carbon 6th Gen, overshadowed by other notebooks with discrete 3D GPUs. With a battery-sipping 8th-gen CPU under the hood, as well as a 1080p panel, we expected battery life to be more than satisfactory. It is, assisted by the large 57Wh battery. 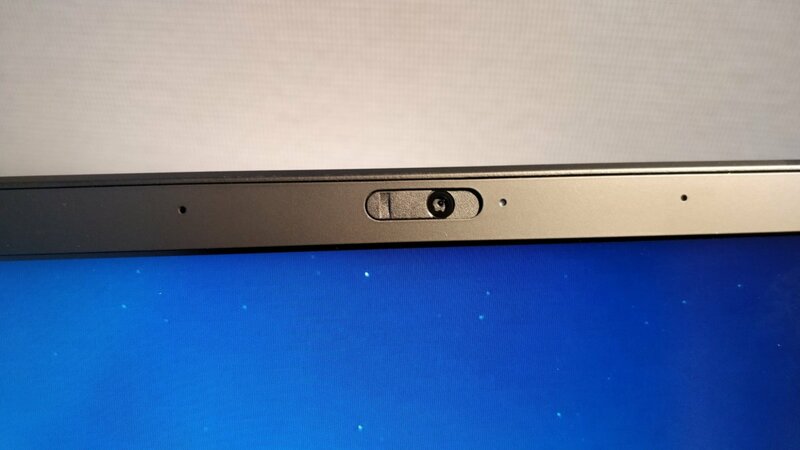 Keep in mind that if you opt for a higher-resolution panel, though, that battery life will fall accordingly. Its duration with an FHD display of just under 9 hours is a bit disappointing compared to the competition, which is hovering around 10 hours or so. 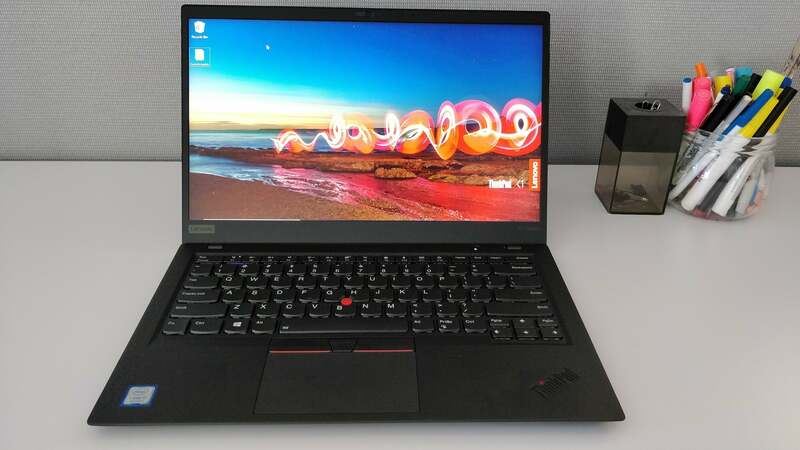 At nearly 9 hours of battery life, the Lenovo X1 Carbon 6th Gen should last through a full day of work, though it pales a bit to some of its competition.